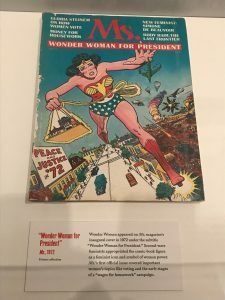 In November 2017, I had the opportunity to go to a new exhibition at the Museum of the City of New York about women in politics — obviously my favorite topic! 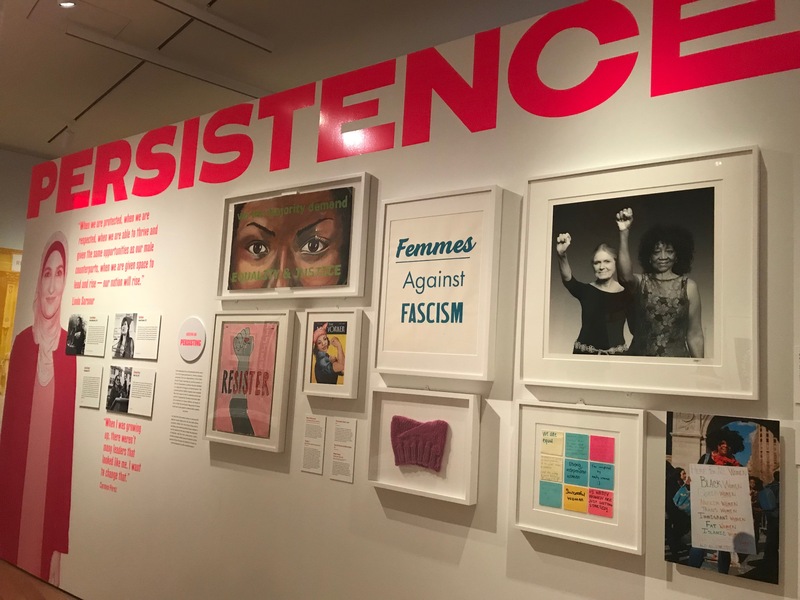 The exhibition, Beyond Suffrage: A Century of New York Women in Politics, traced women’s political activism in New York City over a century. Beginning with the decades-long fight for women’s voting rights that resulted in state wide voting rights for women in 1917 and national voting rights in 1920. I would remiss if I didn’t mention voter disenfranchisement of women of color and other minorities, so even though women technically got the vote in the United States in 1920, that didn’t mean all women. There are still many obstacles to voting in the United States today for many people, but that’s an entirely different blog post. This exhibition was one of the best ones I’ve seen this year — well, technically last year. It was jam packed with so many documents, audiovisual components, costumes and photos that at times I didn’t know where to start! There was everything from a Women’s Political Union Pennant circa 1917 to posters from the first Women’s March in 2017. When I really thought about it, Beyond Suffrage kind of took my breath away and made me unexpectedly emotional. 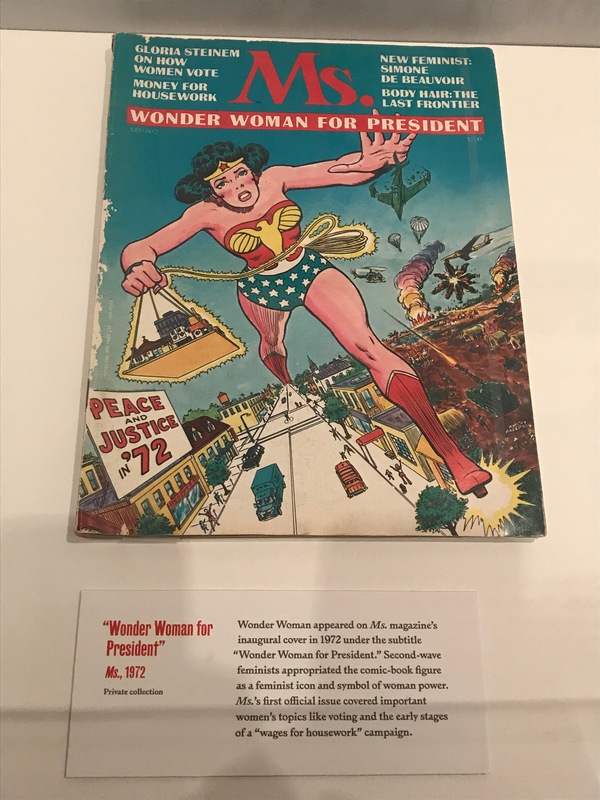 The exhibition was a culmination of sorts and showed just how long and hard women have fought for everything from health and labor laws to education and equal rights. It might sound strange, but I was standing there in the exhibition thinking, because of countless women who I will never know and most of whom I have never heard of, I am able to be at this exhibit right now and I am able to vote and I have a college degree and can have things in my name, like a credit card, for example (In the U.S. women couldn’t have a credit card without their husband etc. cosigning the card until 1974.) It was weirdly emotional, but very cool. Persistence: The Women’s March movement of 2017 and beyond. 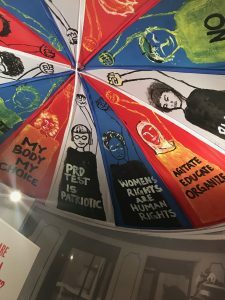 Here’s what the Museum says about the exhibition on their website: “It features a diverse range of activists both familiar and lesser known, the battles they fought, and the many issues they championed. The exhibition examines how women navigated New York politics in the 1920s through 1940s, often working behind the scenes for causes like health, labor, and good government; the central role of New York in the women’s liberation movement of the 1960s and its redefining of women’s roles in politics and government; and continued campaigns for women’s political power and grassroots mobilizations that demand equal gender rights today. Beyond Suffrage features rare artifacts, documents, garments, photographs, and audio-visual materials spanning more than a century that show how women have been politicized, and in turn changed politics, in New York and beyond. I probably spent at least two hours in the exhibition, mostly because I like to read everything, and there was so much to see! The most interesting parts for me were the parts of the exhibit that spanned from the 1930s to the 1980s. I feel like I know a lot about the early fight for women’s rights and for suffrage, and then a lot about the present-day fight, but not much about the mid 20th century. Those parts were great to see and I definitely learned so much that I might have only just vaguely heard of before. This parachute was created for the New York City women’s march on January 21, 2017. It’s called “We Carry Them With Us, They Lifted Us Up,” and is meant to symbolize collaboration and inclusion. I like to pretend I don’t get emotional very often, but anyone who knows me will tell you that is an actual lie. Case in point, this exhibition at times had me on the verge of tears, and I’m not sure why. It was just very powerful to be amidst all of these things detailing the fight for women’s suffrage and equal rights, especially in the current political climate and especially so near to the 100th anniversary of women’s suffrage in New York State, where I was born and raised. I thought I was holding myself together pretty well, until I got to the end of the exhibition, that is. I rounded the corner and passed the displays covering the 1970s, 1980s and 1990s and reached the displays for the 2000s to present. Then I saw a huge “I’m With Her” sign and other objects from Hillary Clinton’s historic 2016 presidential campaign and had to practically will myself not to burst into tears in a public place. I was so glad to see that addition to the exhibition, but it still made me want to scream and/or cry. 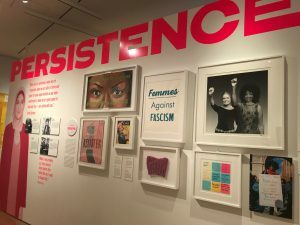 That section of the exhibition was right across from various signage, objects, audio and photos from the Women’s March of 2017, and I think it was a perfect way to end the exhibition, on a hopeful and “look to the future” kind of note. Beyond Suffrage is currently at the Museum of the City of New York until August 5, 2018, so there’s plenty of time to go see it! Tickets to the Museum are $18 for adults, $12 for seniors and students and children and members are free. I would definitely recommend a visit! The future is female!